My original starting point as a barefoot runner and barefoot hiker has been explained in a previous post. The interesting part is that over the past year of barefoot life, barefooting is becoming like a virus, infecting my friends with the desire to start experiencing the same freedom and fun. 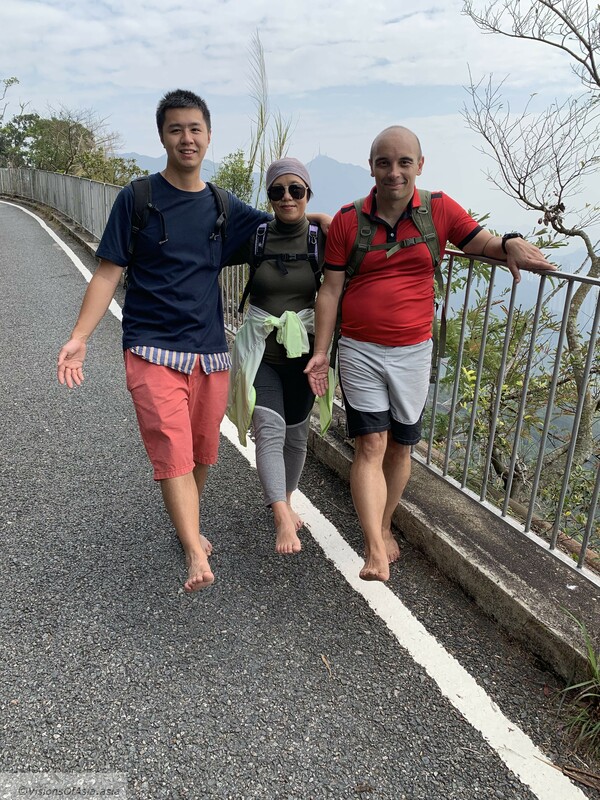 It must be said that the generally positive attitude encountered on hiking trails when they see you barefooting in Hong Kong is quite encouraging. So far, I have yet to encounter a negative response to barefoot hiking or running. Most of the accounts coming from Europe or the US talk about the social stigma associated with walking or being barefoot. 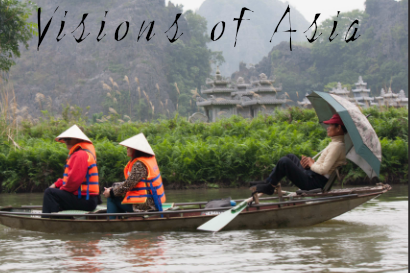 In Hong Kong, on the contrary, and it is probably linked to the Chinese culture of reflexology, there is an acute awareness of the benefits of barefooting. We all know how good barefooting is for our health. Yet, very few of us go out of our comfort zone and do it”. Those thoughts sum up the cringe or instinctive response to barefooting in a nutshell. When you dare go out of your comfort zone for the first time, everything else becomes so liberating. This positive response, heard on the trails, plays as an encouragement and positive reinforcement for those who start barefooting. Capture of our barefoot hike with Matthew on Jat’s incline. When it transmits like a virus! At any rate, the virus of barefooting has slowly transmitted to my friends. 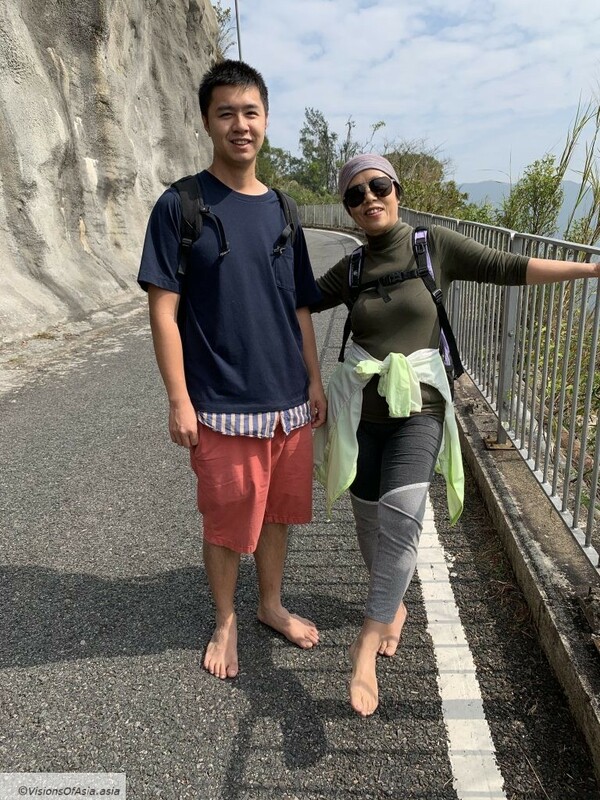 Later, my other friend, Bailey, got also convinced to do a barefoot hiking, especially as he saw me targeting one after the other, the most challenging places such as Suicide Cliff, or Lantau Peak. So, in the end, we agreed to meet up and start a barefoot hike together, including his mother, Linda. Linda has been also barefoot hiking for quite a while and is an experienced barefooter. We chose to take the trail from Shatin to Kowloon peak, as it is an easy trail acceptable for a beginner. It was thus that on the path, Linda kept progressing at a quick rate, Bailey instead huffing and puffing, as the rough terrain was taking a toll on his unconditioned feet. 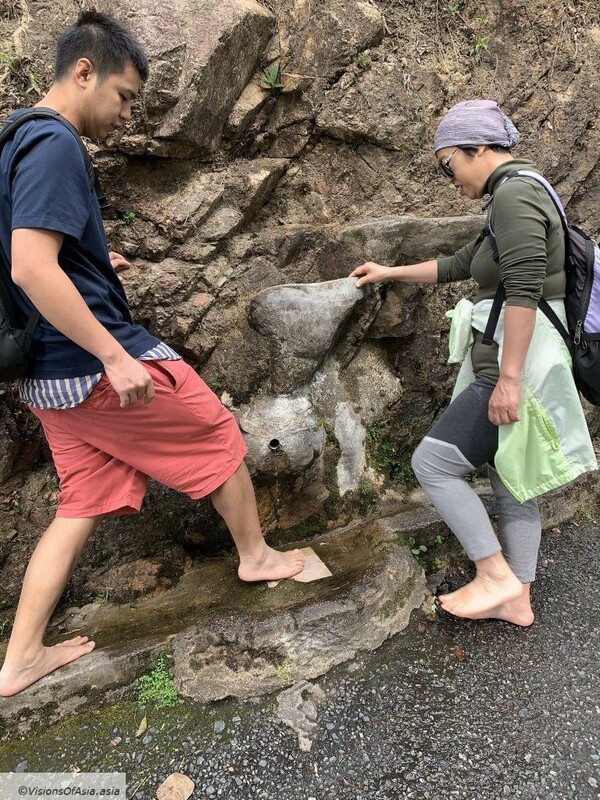 Nevertheless, he managed to hike all the way without wearing his shoes! The beauty of hiking barefoot is that you can dip your feet in any small stream, or wet them to refresh them. Incredibly, Linda showed us quite some feat of suppleness in her stretches during our hike. Thanks to her hard work, this lady keeps an incredible joint suppleness. Maximum barefoot stretch on Jat’s Incline! This shows that barefooting certainly increases your tendon flexibility and ease of extension. As you may know, I often run downhill Kowloon Peak, after a hike around the mountain. Lately, I started long runs around the mountain, which end up with a downhill run. Most of the time, I try to take the Wong Tai Sin route to add some mileage to my runs. Sometimes, however, I take the “short” route and run down Jat’s Incline, which amounts to roughly 9 to 10 kms from doorstep to doorstep. The road can be quite rough in places, so it was a bit of a stretch for Bailey to run down, but he and his mother managed to do it with a great smile! 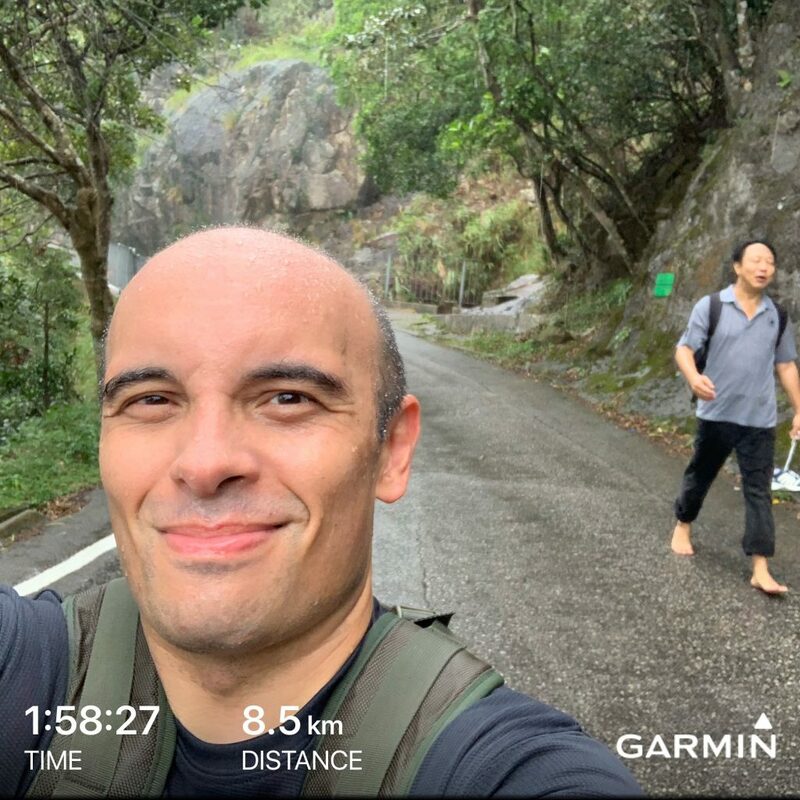 Hiking barefoot and running down Kowloon Peak! Barefooting alone is nice, doing it together is even better! In the end, because we are a social animal, we tend to enjoy experiences in common more than alone… Communication and sharing the benefits of barefooting (without all the nonsense of “grounding”) may incite friends to join you on the trails. 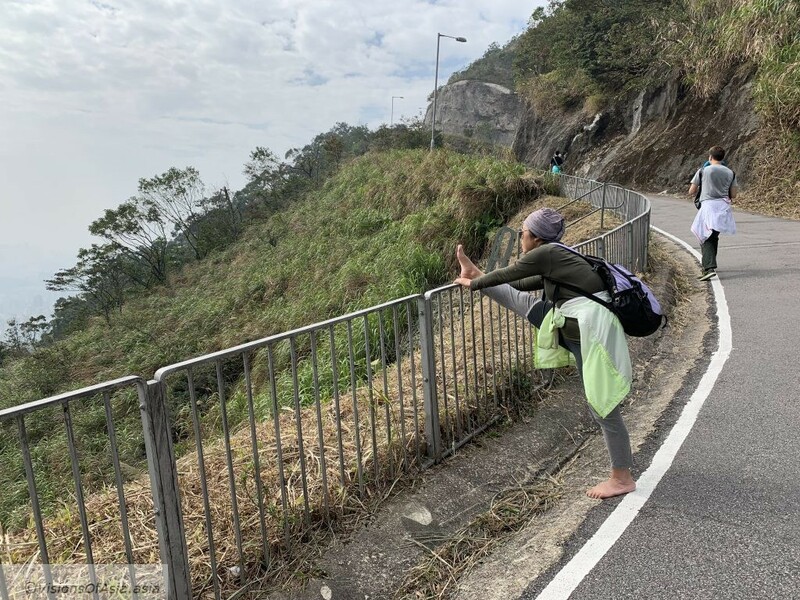 In Hong Kong and Asia, at least, barefooting can be done in a fun way.